Engineers fabricate high-performance transistors with wireless capabilities using a radical fabrication method based on huge rolls of flexible plastic. "We don’t want to make them the way the semiconductor industry does now." A team headed by University of Wisconsin—Madison engineers has fabricated a flexible transistor that operates at a record 38 gigahertz, but may be able to operate at 110 gigahertz. 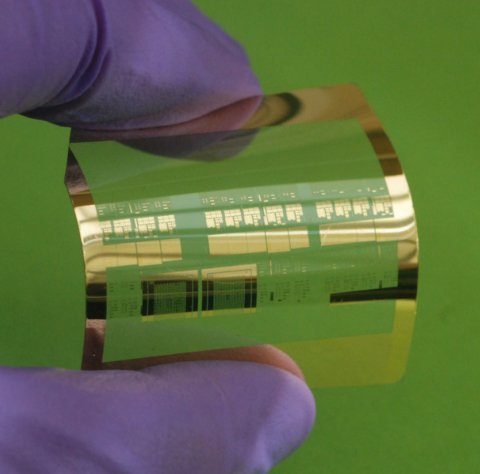 The process could allow manufacturers to easily and cheaply fabricate high-performance transistors with wireless capabilities, using a radical fabrication method based on huge rolls of flexible plastic. The new transistor can also transmit data or transfer power wirelessly, which could unlock advances in a whole host of applications ranging from wearable electronics to sensors. The researchers’ nanoscale fabrication method (based on a simple, low-cost process called nanoimprint lithography) replaces conventional lithographic approaches — which use light and chemicals to pattern flexible transistors — overcoming such limitations as light diffraction, imprecision that leads to short circuits of different contacts, and the need to fabricate the circuitry in multiple passes. The researchers — led by Zhenqiang (Jack) Ma, the Lynn H. Matthias Professor in Engineering and Vilas Distinguished Achievement Professor in electrical and computer engineering, and research scientist Jung-Hun Seo — published details of the advance Wednesday April 20 in an open-access paper in the journal Scientific Reports. With a unique, three-dimensional current-flow pattern, the high-performance transistor consumes less energy and operates more efficiently. And because the researchers’ method enables them to slice much narrower trenches than conventional fabrication processes can, it also could enable semiconductor manufacturers to squeeze an even greater number of transistors onto an electronic device. Using low-temperature processes, the researchers patterned the transistor circuitry using nanoimprint lithography. Using selective doping, the researchers introduced impurities into materials in precise locations to enhance their properties — in this case, electrical conductivity. Currently, the dopant sometimes merges into areas of the material it shouldn’t, causing what is known as the “short channel” effect. The researchers took an unconventional approach: They blanketed their single crystalline silicon with a dopant, rather than selectively doping it. They added a light-sensitive material, or photoresist layer, and used a technique called electron-beam lithography — which uses a focused beam of electrons to create shapes as narrow as 10 nanometers wide — on the photoresist to create a reusable mold of the nanoscale patterns they desired. They applied the mold to an ultrathin, very flexible silicon membrane to create a photoresist pattern. They finished with a dry-etching process — essentially, a nanoscale knife — that cut precise, nanometer-scale trenches in the silicon following the patterns in the mold, and added wide gates, which function as switches, atop the trenches. Additional authors are at UW–Madison, the University of Michigan, the University of Texas at Arlington, and the University of California, Berkeley.